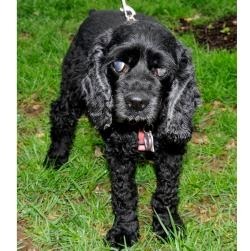 Many of you may remember sweet Miss Lily, an incredibly brave blind and deaf girl who stole OBG volunteers' hearts. She was with OBG twice, the second time sadly after her adopter could no longer care for her. She spent both times with a wonderful foster named Theresa. She loved Miss Lily, aka Sweetpea, so much and gave her such a wonderful life and home. 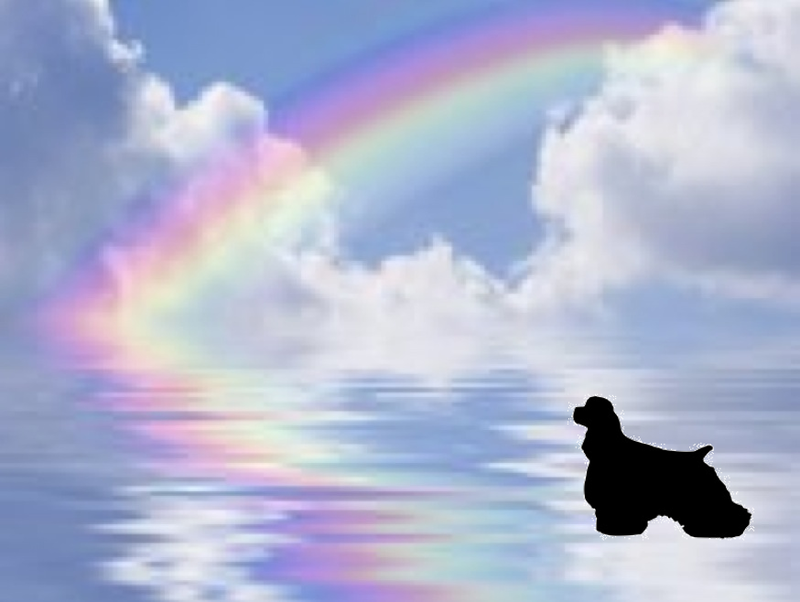 Sadly, Miss Lily passed to the Rainbow Bridge on June 2nd. We are so grateful to Theresa for giving her such a great last few years. Rest in peace, Miss Lily. You are greatly missed. 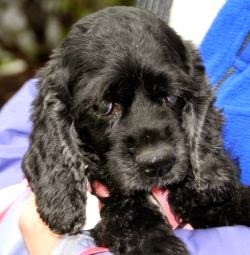 Our funny sweet little Lily came to us back in the spring of 2011. She'd been picked up as a stray down in GA and the staff at the shelter fell in love with her. One thing led to another and she was on a transport to OBG. I remember the day i met the transport to pick her up. This spunky little dog (deaf, blind and HW positive, i might add) came right out of the back of the van and hopped out, right into my heart. The thing about Lily (who was known as Sweetpea at the time) is that she was always so eager to explore life…she was fearless, always wanting to turn every corner, meet every new friend, and savor every new experience. It was so inspiring to watch how she would go about life, tail up (usually wagging), meeting every new adventure head on. She stayed with us for a little over a year and we had some wonderful times. She even did a road trip with her two OBG alum siblings (Angel and Sebastian) to Florida and then home via Atlanta. We stayed with my brother in Florida, where my sister-in-law fell in love with her (she was always charming folks with her intrepid spirit). One of my favorite stories was the time we were outside sitting around my brother's pool, while Lily explored the yard (she was adept at navigating and mapping new places), when suddenly SPLASH!! There was Lily in the pool! Of course i had a heart attack and dove in to get her ~ and when i got to her i realized she was happily paddling about having a grand time! Nothing fazed her. She had a great time there with her cousin Daisy (a border collie who was delighted with the cocker invasion) and then we were off to Atlanta to visit an old friend of mine, where she made three new doggie friends. And she had a blast. About a year after she came to us, and much to my surprise, a wonderful woman contacted me about adopting, yes adopting her! She wanted to adopt a dog that no one else would want and figured an old dog (we guessed 11 or so by then) who was deaf and blind would be pretty unadoptable. I will never forget the way Lily happily hopped right into the car to drive off with her new Mom, tail up and wagging, as always. She had a loving, doting Mom who named her "Joy" for obvious reasons. :) Unfortunately, though, her Mom developed health problems of her own and was no longer able to care for Joy, so one day last fall, I made the sad trip to go pick her up. It was one of the saddest things i've ever done for OBG. 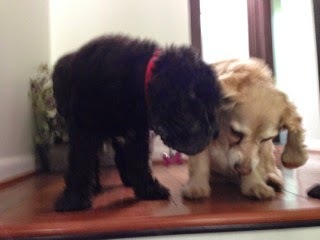 Her Mom was heartbroken at having to say goodbye to her girls (she had adopted two OBG dogs), but there was no choice. She couldn't come back to us immediately, so Lily spent some time with the wonderful staff at Ft Hunt Animal Hospital and then with a temporary foster. But soon she was back with us, as dear and as inspiring as ever. In the time Lily was gone, we'd moved, my Angel had herself gone on to the Rainbow Bridge, and Gingersnap had joined our family. Our Miss Lily quickly adjusted to her new home, mapping everything in no time -- no small feat since we'd moved to a rural setting and she had acres to explore. It was especially sweet to see her with Sebastian, her old buddy. She had slowed down quite a bit, but was still her old self. In fact, funny thing, there is a little pond in the garden and, you guessed it, she was walking around one day (after navigating around it many times) and all of a sudden ~ SPLASH! and, yup, once again she was happily dog-paddling about while i was lunging to get her. She was always a very affectionate dog, but not really cuddly -- she just really loved being with her family and it was amazing how she always knew where we were and when we left and she'd be right with us. She had a special talent for finding dog beds, and there she'd be. She did enjoy her pack. It was so funny (and maddening!) when I'd try to get dinner ready -- Sebastian, Gingersnap and Lily, and Cobbler and Charlie (the feline members of the pack) would all bounce and wiggle like one big fur mass, and our intrepid Lily would be right there in the thick of it. But she was having more and more trouble, some little things, some not so little things, and none of them had any chance of getting better. So, after much consultation, we decided that the kindest thing to do would be to say goodbye. The morning that I was going to take her to the vet, when it was time to go, she paused on the landing to come down into the kitchen and her old pal Sebastian came up to her and planted himself right next to her as if to say 'one more hug, one more hug'…and he wouldn't budge. I was with her right to the end, she died peacefully. And so I say thank you, dear Lily, for being part of our lives, for showing us how to face each day, each adventure with Joy, eagerness, and openness, for never letting things like not hearing and not seeing stand in the way of living your life to the fullest. Our intrepid little girl. You are an inspiration.